Most times, most beginning anglers tend to forget about buying fishing pliers when shopping for or assembling their fishing gear, but that takes away nothing from the importance of these handy tools. 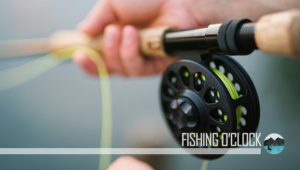 While a newbie might believe that the only useful tools for fishing are rods, reels, lures, and traces, a professional would definitely know better – know that fishing might require more than those aforementioned tools sometimes. Therefore, with the best fishing pliers, fishing will become more efficient and effortless. The most experienced fishermen know that fishing pliers are totally indispensable. They are usually useful when you are making a catch and you have to bend wires, retrieve hooks, cut fishing lines, change split rings, and more. However, if you’re in the market for an ideal pair of fishing pliers for your needs, figuring where to start from may confuse you. Thus, we have provided comprehensive fishing plier reviews of the top products on the market. Not only that, but we have also included a handy buying guide that aims to guide you all through your shopping. Like we promised at the beginning, this article aims to help you choose the right pair of fishing pliers for your needs, starting with the reviews below. With its high corrosion resistance, saltwater approval, and high durability, the Madbite Fishing Pliers is very sturdy aerospace-grade aluminum alloy fishing pliers. This tool features tungsten carbide cutters and chrome steel jaws, therefore giving the pliers a high vigor for every kind of fishing line, including braid fishing line, fluorocarbon line, and mono line. In addition, the product comes with a luminous 18k LED light which gives you an extra brightness and allows you to see you’re working on. If you are someone that cares a lot about aesthetics of your fishing tool, you will surely love these pliers from MadBite as they are available in different colors. With the red, blue, and yellow colors, the manufacturer assures the night angler to easily find their pliers. 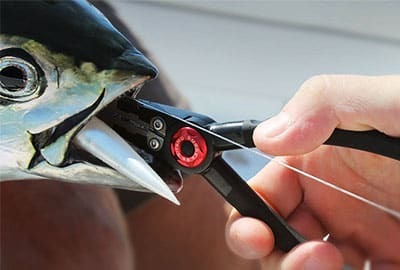 In fact, the Madbite Fishing pliers are very strong that they allow rapid removal of hook regardless of the type of fish. Furthermore, the plier comes with a handy sheath that is connected to the pliers with a mild carabineer and a kind of coiled plastic lanyard. One of the primary features of this product is its decent silicone grips. Unlike some metal handles, the handles on these pliers are corrosion-resistant and do not retain odors like some rubberized handles. Besides, they aren’t slippery at all. Easily cuts a braided line. The rubber handles do not retain odors. The nose might be too short for some types of fishes. First of all, it is comfortable to use. It’s lightweight, and sporting a great construction, therefore, Piscifun pliers are suited for both salt-water and freshwater. One vital thing to keep in mind is that the pliers measure 6.7”. While the jaws of the pliers are produced using titanium-blanketed stainless steel aluminum, its handles are produced using aluminum. The motive behind this is to reduce weight and as well deliver corrosion resistance. The cutter functions well, even better than most fishing pliers, and can easily handle different types of fishing lines, including fluorocarbon, braided, and mono line. The only major downside is that the cutter’s position is excessively upwards. At the back is a gap which you might easily slide the avenue into if you are not paying attention or if its dark. While this can be a predicament, it’s something to keep in mind. In general, these are a decent pair of fishing pliers. They perform quite well, are lightweight, long-lasting, and easy to use. They’re easy to carry around due to the belt loop clasp. This product is a bit expensive than most fishing pliers out there, so we’ll only recommend it to anglers who are ready to pay just a bit more for the best. Cutters’ position is excessively upward. If you are looking for a gear that seamlessly combines quality with portability, with its’ aluminum-coated and corrosion-resistant metal, this pair of pliers is suitable for saltwater and freshwater environments. Whilst being anti-corrosion is the cornerstone of this product, it also does well as a braided line cutter. And the easy to replace tungsten carbide cutters on these pliers offer you a long-lasting usage at lower prices. Therefore, these cutters are very sharp and are capable of cutting through the strongest braided lines. Another strong point of the pliers are the jaws are inset stainless steel. The jaws are durable and coated. The rugged design enables it to hold tight hooks whilst offering your hand protection. You don’t need to get worried about not getting hurt whilst fishing. In addition, the pair of plier is easy to carry, and since the grip is spring-loaded, the tool can be used with one hand. Besides, there is an extra steel wire-coiled lanyard alongside a nylon holster that means it’s quite impossible to forget this tool. However, nothing has ever been made without a flaw, and these pliers continue along that line. One major drawback with this product is that its screws easily loosen up, which cause wear and tear while in use. Besides, the handle is a little slippery and can be problematic during fishing. Being an epitome of a portable pair of fishing pliers with good aesthetics, you might want to put your trust in the Zitrades Fishing Pliers each time you go fishing. This multi-functional tool aims to seamlessly combine the use of scissors and pliers to offer you an all-purpose tool. The pliers feature a long-nose design for simple removal of hooks. The pliers are incredibly effective in extreme situations, thanks to the Special Deluxe aluminum body. Specifically designed to fit a fisherman’s needs, the Zitrades fishing pliers feature a skid-proof and high-density handle. Using the pliers is as simple as ABC, and it can be used by beginners and experienced fishermen alike. There is a belt loop and a lanyard on the pliers’ holder, which prevents you from forgetting the instrument at the shore. The pliers provide more grips whilst holding items, and the jaws are made using stainless steel to offer power and durability. These pliers can remove various kinds of hooks, thanks to its incredible versatility. A minor drawback is that some rugged usage can de-shape the clips. The de-shaping is usually noticed in the course of ice fishing. Here is another decent pair fishing pliers that requires our attention. At first glance, these fishing pliers might appear like an ordinary cutter with well-sharpened edged grooves. As soon as it is deployed fully, you’ll begin to see these pliers in a totally different way. The manufacturers of the pair of pliers make it to be functional for thirteen different features, making it one of the most versatile pairs on this list. It can remove the hook, split the ring, cut the line, and achieve many other major fishing activities. All the different tools in this pair of pliers fold neatly into its handle. The two handles are spring-loaded, which enables you to conveniently and handily carry out the cut. The pliers also have a very compact design, which means it can easily it any pocket and can be folded easily into a small tool. On the material front, the pliers are made using polished and anodized stainless steel. Besides, the pliers are also resistant to rust that is caused by salt-water or even other substances. However, while the pliers’ jaws aren’t stainless steel, it instead utilizes the thick steel to guarantee heavy-duty performance and optimum durability. This fishing equipment also comes with a customized sheath which makes carrying around effortless. Produced using stainless steel and sporting a very lengthy needle nose, these pliers are ideal if you’re looking for a pair that would enable you to go deeper into your catch, especially if you’re catching a big fish. The nose of the pliers is a bit bent for easy hook removal. Moreover, the pliers boast spring-loaded jaws, a quite sharp cutter, light angling equipment, and accurate split rings. Moreover, apart from being reliable for salt fishing, these pliers also come in handy for ice, lake, and river fishing, as they are incredibly easy to use and accurate. However, despite the corrosion-resistant advertisements, the stainless steel has a tendency to rust. Therefore, it’ll be wise to rinse in fresh water after saltwater usage. Besides, the handle of the pair of plier is a little slippery, and the ragged tip isn’t adequately aggressive to properly grasp the hook. Spring-loaded jaws carry out their job well. The handle is a bit slippery. The serrated tip isn’t aggressive enough. 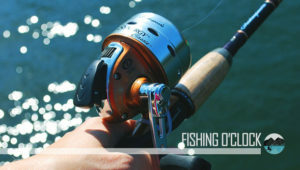 Nowadays, numerous fishing tools’ objective is to improve the experience of many anglers. A pair of fishing pliers is one of the most helpful fishing tools you can buy. While some fishermen pay only a little attention to them, people who know their importance and advantages wouldn’t dare play with them. A fishing plier is such an important fishing instrument that will definitely enhance your experience. Buying a fishing plier is more than just buying a tool that will carry out the basic function of a plier – you actually need a lot more than that. 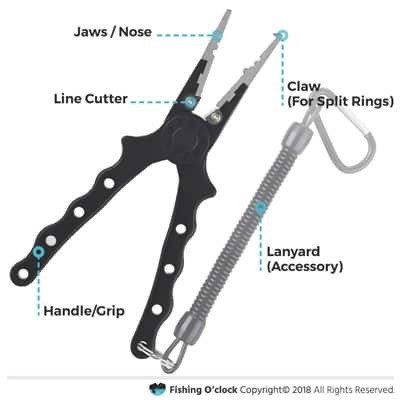 If you are in the market for a new pair of fishing plier for your needs, below are some important factors you must consider. Generally, the quality of a pair of fishing pliers is usually determined by the material from which it is made. What you need is a type of plier that is capable of helping you to unhook the fishing line and release the catch from your hook, without being affected by corrosion or locking shut. New standard fishing pliers are produced using airport-grade aluminum alloys. Due to its rigidness and the fact that it doesn’t easily rust, aluminum is by far the best material for manufacturing fishing pliers. Moreover, the material is lightweight, making it simple to transport and utilize the fishing pliers. Majority of the top of the line models nowadays are produced using airport-grade aluminum. Apart from being very sharp, line cutters should also have a high-tensile strength. If you’re intending to cut fluorocarbon or monofilament, normal cutters may be enough for you. if you are, however, considering using lots of braids, you must have fine and sharp cutters. Hardened and sharpened cutters are usually perfect for professional anglers. For good reasons, needle nose pliers by a wide margin are the most common kind of pliers. The length and design of these pliers allow them to go much deeper into the angle to take the hook out. Apart from being highly effective pliers, needle nose pliers are also ideal for catching big fishes and salt-water fishing. Also, you can opt for split ring specialty fishing pliers. The kind of nose a plier is equipped with also determines the sort of job it can do. Split ring specialty pliers, for the use of the nose, are usually shorter than their saltwater counterparts. The handle of the plier must be sufficiently comfortable to not make its usage painful when out fishing. On a good fishing day, you can wind up in a circumstance where you catch lots of fish, which means you get to utilize the fishing pliers a lot. And a lot of hook removal and cutting usually leads to pain, particularly when you have utilized it for a long time or if the plier’s handle is not sufficiently comfortable. Ensure the product you go for has comfortable, anti-slip handles. Fishing pliers are usually produced using a variety of materials, with every material being unique in its own way. You can select your fishing pliers depending on the options it offers you as a fisherman. Great fishing pliers usually have both two line cutters along with a side cutter. While ever fishing plier has the line cutter, only some come with a side cutter. Due to the sorts of tasks you will be using the liner cutter to tackle, it has to be sufficiently strong to cut fluorocarbon, monofilament, and braided lines. It is with a sturdy side cutter that you’ll have the ability to cut steel wires or hooks. Several top of the line pliers come with replaceable cutters, which allow you to easily replace yours in the event of wear out. When shopping for the ideal pair of fishing pliers for your needs, you must think about the construction quality of the handles. The right type of pliers usually have ergonomic, non-slip handles for easy usage, particularly with slick hands. Moreover, consider purchasing spring-loaded pliers so that you will not need to be adjusting your grasp constantly. You will want a solid side cutter that will enable you to easily get rid of a hook’s shank should it get buried in your tool, or your flesh, in a worse scenario. Inexpensive fishing pliers can break when exposed to the severe pressure of cutting a hook, so you want high-end pliers to do this. Remember the length of the handle and nose for profound removals of hooks. This will mostly depend on the fish species you are going after. Salt-water pliers ought to be longer in length since you are usually dealing with toothier and larger fish. Fish slime, fishing lures, and water are all capable of making things slippery to grip. When you require your fishing pliers to release a catch, fumbling around is no fun. Pliers with shaped grip are firmer in the hands when they are needed the most. This feature is only a bonus, and it can be useful when you have to replace or change a triple hook on your lure. Without a split ring tool, you’re left to fumble around with only your fingernails to set up split rings. 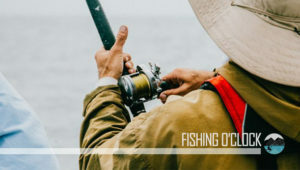 Normally, we consider a lanyard as a must-have for high-end fishing pliers, particularly if you are fishing on large bodies of water where the boat can be suddenly pitched by waves or from a kayak. If you’re looking to use your fishing pliers in the most effective way, our guide here will help you do just that. The first step is opening the handle of the pliers to expose the jaw. You can easily do this by pressing the nose of the plier, which is usually found in the middle of the rings. Whilst resolutely holding the fishing plier, slip the old hood around its ring until the fishing plier appears from the end that is open. Keep in mind that you’re pushing the plier around to ensure that the split ring stays opened so that the hook will be able to pass through easily. Now, open the plier’s split ring, slip the fresher hood appended to the open end. You will need to keep repeating this process until the hook clears the ring. When you’re through, take the fishing plier out from the ring to ensure that your bait is ready for angling with a newer hook. Whenever you detect a dull or damaged fishing hook, repeat this process. If you are looking for a fishing plier to cut lines, then you must buy a model with a line cutter. This can be useful when you are looking for an ideal instrument to cut tag ends, leaders, or mainlines. The plier’s line cutters should have the ability to cut braided lines. Also, it should carry out heavy-duty cutting tasks where you have to slice heavy-duty lines or wires with no issues. Having a plier that has a line cutter can also be space-saving since you don’t have to put a separate cutter in your kit. The material with which the cutter is made should be made up of rugged material. Also, the toughness makes sure that the blade remains sharp for long. Stainless steel or tungsten materials are usually the favorite choices of most anglers. In high-end fishing pliers, the cutters are separately positioned either at the lower part or at the top part of the jaws. Most experienced anglers prefer the cutter to be at the plier’s side to prevent its interference with the primary operation. Literally, a pair of pliers with a slippery handle is as good as useless. In fact, grips are probably one of the first things you must take into consideration before purchasing a pair of fishing pliers. Keep in mind always that fishing pliers do not handle you, you handle them instead, which means it’s always preferable to have an excellent handle. Since the handles typically make up a significant portion of the plier’s weight, most manufacturers use top of the line aluminum to ensure that the handles are strong and light. As regards the shape of the handles, they ought to have shaped grips along with a plastic or rubber cover. Whilst some people prefer additional cushioning, other people prefer going minimalistic. Remember that force is usually applied through the handles, which means your grip ought to be close to perfection. Premium fishing pliers have jaws that provide great grip and diverse crimping sizes and dimensions. The jaws usually come in deep or shallow variations and offer the appropriate fit for different kinds of rings, wire, hooks, and more. Basically, these are shaped spots on the cutter’s inner side and are utilized for stretching, holding, unhooking and molding. Also, jaws are composed of premium materials. They are the components that endure the tool’s tougher functions and withstand maximum force. Split rings are basically the nose of the jaws of your pliers. This part serves as a great addition to the tool as they usually come in handy if you are used to working with littler terminal tackle gears. They are usually important particularly when you’re intending to replace hooks or make your own blades and spinners. Most experienced anglers tend to prefer fishing pliers that have split rings. There are, however, great pliers in the market that lack split rings. Your final choice will depend totally on your personal preferences and requirements. Manufacturers who are responsible for the leading pliers in the market don’t usually focus on the tool’s operation only. They also consider the ease of carrying and portability of the plier so that it has longer longevity. With this in mind, most good fishing pliers come with lanyards. Lanyards are rubber or nylon ropes that aid the efficient carrying of the fishing pliers. You can consider as an attached keychain on your fishing pliers. The lanyard can be easily attached or hooked to your vest, bin, or clothes. Although lanyard is a non-compulsory addition, it’s very useful since it makes grabbing and storing your tool extremely easy. Besides, hooking up fishing pliers and keep them closer offers the convenient feeling that you’re never lacking in options whilst fishing. A sheath also helps users to store the fishing pliers in a more efficient manner. Basically, a sheath is a holder for fishing pliers in which the tool can be stored and then kept safe while fishing. Since fishing pliers are usually made with razor-sharp edges, you could risk cutting your cloth or skin when inappropriately stored. A sheath helps protect unwanted scratches or cuts. You can easily attach the sheath to your belt for easy usage when the plier is needed. What exactly are fishing pliers utilized for? While fishing pliers appear exactly like the regular pliers, they are designed especially for fishing. These pliers are utilized for removing hooks, lure, and baits, catching fish, setting slit rings up, cutting fishing lines, crimping, pulling, stripping, bending wires, and carrying out other functions based on the different features a certain pair of fishing pliers is equipped with. You can utilize your pair of fishing pliers to tighten hooks, grab lines, flatten hook barbs, and even get rid of a hook safely from your flesh in the event of an accident. The pointy tip on fishing pliers is for what? The pointy tips usually seen on fishing pliers are extremely helpful. The tip is designed specifically to open split rings. It makes replacing and changing a hook quick and easy. You don’t need to struggle with opening and installing split rings with your fingernails, which can be frustrating and dangerous. Why exactly do I require a pair of fishing pliers? If you are currently questioning whether you require a set of fishing pliers or not, we assure you that you are not alone. A lot of fishermen ignore this instrument and realize its usefulness when they face an issue but do not have the necessary tool to fix the problem. A set of fishing pliers is a crucial tool that you must ensure you include in your fishing kit. Without a good pair of fishing pliers, you will go through the frustration that comes along with being in short supply of gear, which can totally ruin your fishing experience which you might have otherwise enjoyed. You are out angling on a sunny day. It’s starting to be a quite successful trip until you catch the fish only to find out that you lack a tool to remove the hook, cut the line or even bend a hook in its place. In addition, a set of fishing pliers is useful in the event of an emergency like when a hook sinks into your flesh and you desperately need to remove it. Learn how to properly catch and release here! Now since you’ve found your pliers, check out our picks of the best fishing backpacks for anglers! Also, here’s what to look for when buying a fishing reel. As a modern angler, an excellent pair of fishing plier should always be in your kit, regardless of the type of fishing you are doing. It totally simplifies tasks that seem hard originally. We are confident that after reading our fishing plier reviews, you will be questioning yourself and how you were doubting the need for a pair of fishing pliers. When you have one of the best fishing pliers in your kit,as a result, you will start having more productive and more enjoyable fishing trips. And having comprehensively reviewed some of the leading choices on the market, we are confident that you can’t go wrong with any of the products we have recommended and reviewed. Just make sure you keep our tips in mind while shopping and we assure you that you will end up with a model that is perfect for your needs. © 2018 Fishing O'Clock. All Rights Reserved. 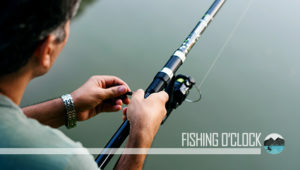 fishingoclock.com is a participant in the Amazon Services LLC Associates Program, an affiliate advertising program designed to provide a means for sites to earn advertising fees by advertising and linking to amazon.com.